/ins.The Merivaara Q-FlowTM surgical light improves the working environment in operating rooms, and also offers a new way to reduce the risk of infections. The Merivaara Q-FlowTM surgical light improves the working environment in operating rooms, and also offers a new way to reduce the risk of infections. 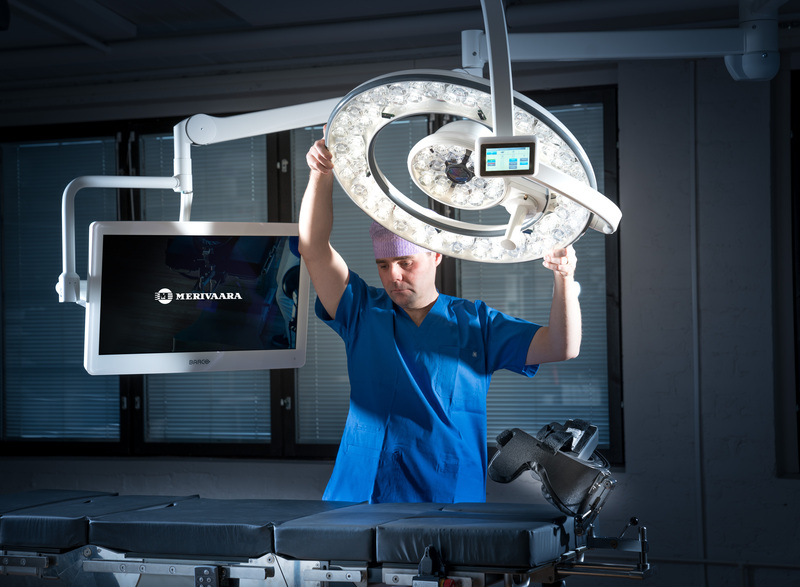 The new Merivaara Q-Flow is a major step forward from traditional operating room lights. Designed and manufactured in Finland, Q-Flow was developed to fulfil the needs of the modern surgical team. It offers improvements on many standard features in the industry as well as radical innovations. The light achieves superb colour rendering, particularly in red and skin shades, which makes the product perfect for a variety of surgical procedures such as internal or plastic surgery. The Q-Flow gives a very deep column of light and dynamic obstacle compensation, so if the surgeon bends over his or her patient, sensors brighten other LEDs to reduce shadows. Moreover, the light has sterile and intuitive controls. The Q-Flow displays simple user instructions on the operating table so the surgeon does not have to look up. One of the most ground-breaking features is the way it improves hygienic conditions. Standard operating room lights create turbulence intensity, acting like an aircraft wing to pull particulates in the air right over the patient. Merivaara’s designers shaped the Q-Flow as a series of concentric circles with open spaces in between. This improves laminar air flow so sterile conditions are maintained and the risk of infection is reduced. The standard turbulence intensity should be below 37.5% but the Q-Flow boasts 15.9% according to the DIN 1946-4:2008 standard. 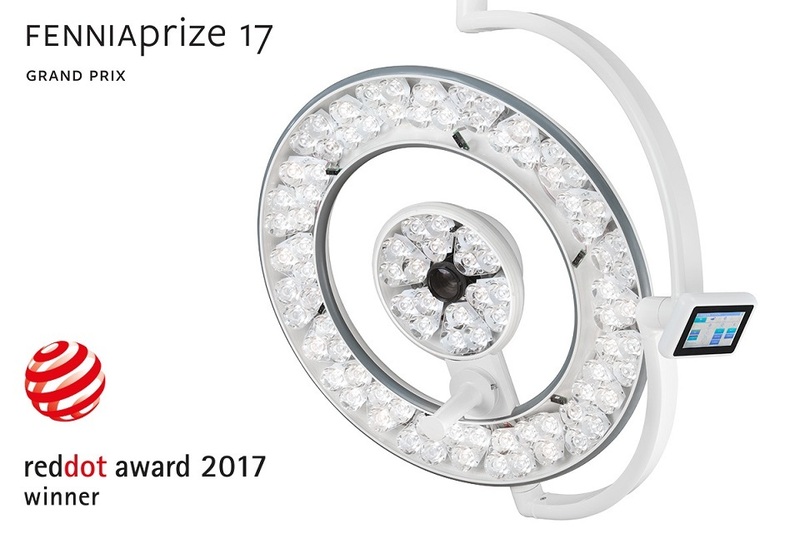 The Q-Flow surgical light has already won two prestigious design awards: the Red Dot Award for Product Design in 2017 and the Fennia Prize Grand Prix 2017 for its outstanding design. The Q-Flow is a part of the Merivaara FluentTM concept, which enhances the usability of operating rooms. This includes an intuitive user interface which works across a variety of devices, such as Q-Flow, operating tables and an integrated management system. Often a single operating room may have equipment with different user interfaces. With Merivaara Fluent, each device can have the same user interface, allowing the medical staff to concentrate on the patient instead of learning how to use the devices. Q-Flow is being showcased at FIME 2017 on August 8-10, 2017 at the Orange County Convention Center, Orlando, Florida, USA. Come and see the award-winning surgical light at our booth BQ43. Merivaara focuses on offering solutions for operating theatres, surgical departments and recovery rooms. Additionally, Merivaara provides a wide range of other furnishing solutions for hospitals, day surgery and health clinics. Established in 1901, Merivaara has more than 116 years of experience in designing and manufacturing hospital-grade equipment. The user experience of our customers and uncompromised quality are at the heart of Merivaara’s company culture. Merivaara’s products are used in more than 120 countries thanks to their ease of use, durability and ergonomic design.